I got an interesting appeal from our CSA, Fox Creek Farm, right before we went on a long vacation. Back now, and I wanted to bring it up to the Farm Share community and get your thoughts. Our friends at Fox Creek Farm sent along a link to an article in the New York Times: When Community Supported Agriculture is Not What it Seems. I must say that I've generally been supportive of more ways to shop local. There are many folks whose schedules or lifestyles don't lend themselves to the routine of CSA pick-ups and organizations like FieldGoods allow them to enjoy fresh local produce "on demand." What the NYT article points out is that these new ventures are not really CSAs, though they use the language of CSAs in marketing. In fact, they're venture-capital-funded distributors that contract for produce from family farms. While they do provide a new outlet for family farmers, the farmers assume a lot of financial risk added to the inherent weather risks of farming. Fox Creek reports that with the rise of these alternatives, that their subscriptions have been stagnant after a period of robust growth. It struck me, listening to all the presidential campaign rhetoric, that while globalization is demonized for declining wages in America, there's been no mention of the rise of huge internet corporations for erasing whole categories of work and community. The beauty of a CSA is that you establish a direct relationship with the folks who are growing your food. You get to help out in the harvest if you want. You get to watch their kids grow up. You get to contribute to the health and strength of the community you live in. In their latest newsletter, I saw that Fox Creek Farm is offering a 30% discount on mid-season sign-ups. This seems like a great way to check out their produce. They have a lot more pick-up locations than I realized. Pick up times are 4:00-6:00 p.m. If you're interested, you can e-mail them at foxcreekfarmcsa@earthlink.net or find a pick up location near you on their website at www.foxcreekfarmcsa.com. 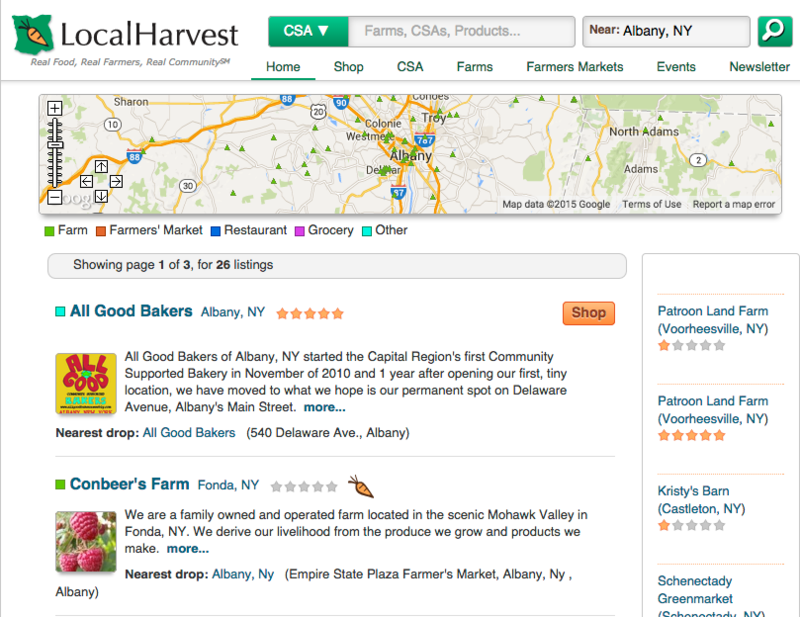 Screen shot of Local Harvest CSA search page. I know, you thought it was Valentine's Day. And while people who live on chocolates, flowers, and restaurant food may revel in the PinkFest, those of us who like organic strawberries with our chocolate are thinking about summer and wondering what will come in our first farm box. Until two years ago I was nervous about committing to a CSA (Community Supported Agriculture). I liked going to the Schenectady Greenmarket and it seemed counterproductive to drive long distances to pick up food at a farm. I was also worried that there would be weird food and/or too many vegetables for us to eat in a week. I finally decided to give it a try when I stumbled on a super-local farm that I could bike to on volunteer days. I have to admit that we did get a lot more radishes early in the season than we expected, but the super-fresh organic blueberries, strawberries, garlic, and greens more than made up for it. I cut back on growing vegetables at home and planted more cut flowers. Paying ahead for vegetables meant that we could splurge on a grass fed beef share from Gordon Farms and start getting our milk delivered at home in bottles from Meadowbrook Dairy. So not only do I get great, healthy food but I also get to feel like a princess. And we still go to the Schenectady Greenmarket and other local farm stands to fill in gaps. When I learned that our farmer was ending his program this year, I headed to LocalHarvest.org to see what other local CSA programs are out there and I urge you to do the same. As you scroll down the list you'll be amazed at how many deliver to convenient sites. You'll want to narrow down your choices and then click over to the farm's own webpage. And pay attention to signing deadlines and discounts. I was happy to learn that Fox Creek Farm doesn't have a work requirement but does plant a You-Pick garden. I donated my early-signing discount to their new program that provides fresh food to underserved neighborhoods. Plus they deliver to a spot in Altamont that's just a mile from my house. So my princess status will be guaranteed for one more year. These red turnips came from the farm CSA. One of the best things about CSAs is being able to try new vegetables. Tip: Just about everything tastes better roasted. In this compelling Ted Talk, Stacy Mitchell lays out the reasons why buying local -- alone -- will not solve the concentration of power among big box retailers and big banks. As she says, we we can't make the world a better place by being better consumers. This won't change the fundamental fact that we are swimming upstream against a powerful downcurrent of public policies that are taking our economy in the wrong direction. She advocates for pushing changes in public policy that will support local farms, local banks and local infrastructure. It's a powerful argument.